We would like to extend a special Thank You to Donna Schaal, cosultant to the Lincoln Trails Libraries System, and Mark Hanson, curator of the Chanute Air Museum, for providing us with a wonderful series of historical photos and information about the Tuskegee Airmen. As we work this year to honor these brave men for their heroic actions, these photographs provide a clear picture of the lives and times these fine gentlemen. Over the coming weeks, we will be featuring a number of these photographs both on our site, and at our various events. 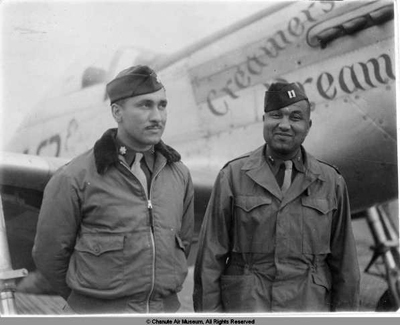 We encourge everyone to take a look and appreciate the dedication of the Tuskegee Airmen both on our site and at the Chanute Air Museum’s online photo gallery, provided by DigitalGems.info and the Lincoln TRils Libraries System. This entry was posted on Thursday, October 15th, 2009 at 4:15 pm and is filed under Uncategorized. You can follow any responses to this entry through the RSS 2.0 feed. You can leave a response, or trackback from your own site.